There is a huge bug when Group Messaging is disabled in iOS 5. I'm shocked Apple hasn't fixed this yet. 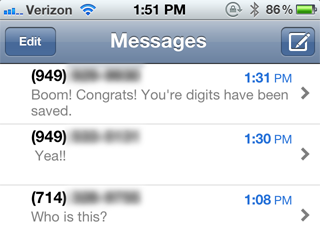 Today a friend sent out a text message blast, announcing they got a new phone number. Shortly after, I got text messages from three random people I don't know. I was confused how these people got my number, but then I realized they were replies intended for my friend who sent out the text blast. If you've ever used the Group Messaging feature, it's supposed to thread messages sent to groups, showing the person's name above their reply. But in order to use this feature, you have to explicitly enable Group Messaging. If you don't enable Group Messaging, messages from anyone who replies will be sent as text messages to everyone on the thread. But what's worse: your reply will, unbeknownst to you, be sent to everyone on the group message. The problem is that there is absolutely no indication your reply will be sent to anyone other than the person you're replying to. 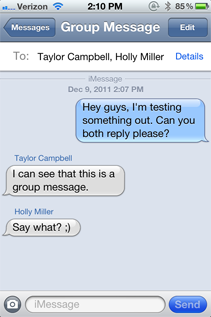 If you don't have Group Messaging enabled, it's pretty cut and dry: your reply should not be sent to the entire group. I kind assume this is an Apple backward compatibility "feature," but I'm not the only person surprised by how this works. In this Apple Support thread, representatives from both Apple and cell phone companies were shocked to discover replies get sent to everybody on the thread. Apple really screwed up on this one. If you have Group Messaging disabled, you shouldn't be getting replies from people you don't know. But more importantly, your reply shouldn't be sent to a group of people without your knowledge. The biggest err on Apple's side is the lack of communication of how this feature works. You can't just change how text messaging works without informing people. There needs to be instructions around the Group Messaging feature that explains if you turn the feature off, your reply can get sent to a whole host of people without your knowledge or intent.